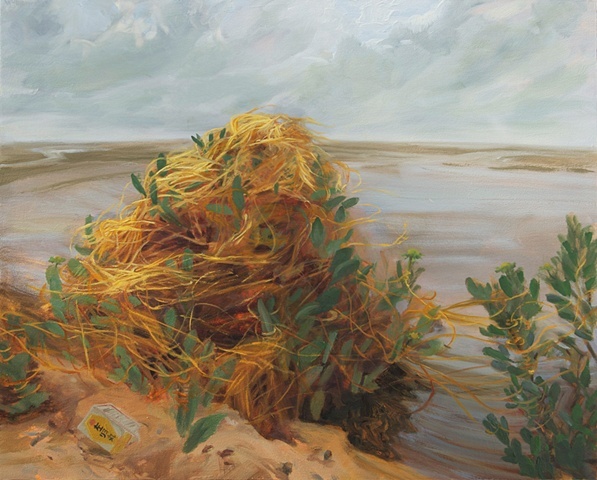 Kristin Musgnug‘s recent paintings of invasive species are at the University of Arkansas’s Fine Arts Gallery, through March 11. I grew up in a small town in southern New Jersey. Although I definitely wanted to be an artist by the time I went to college, I ended up not liking the extremely conceptually-oriented art program where I was (Williams College) so I majored in Art History instead. I did spend a lot of time out in the woods of the Berkshire mountains, which probably had something to do with why I ended up being drawn to landscape painting. After college and a year of banging around in New York, I went to the Pennsylvania Academy of Fine Arts, which, for those who don’t know it, is a 100% opposite kind of place – all technique and no content. At that time it was still very much a 19th century, beaux-arts training – we drew from plaster casts of antique sculpture and painted and drew from the model, all day, every day. I went there because I thought I wanted to paint people – I had been making all of these narrative collages. After a couple of years of painting from a model all the time, I was completely sick of that kind of figure painting and starving for someone to talk to about content. I went back to my collages, started using them as a point of departure for paintings, and that was when I left there and went to Indiana University, in Bloomington, for my MFA. After a year of trying to figure out how to paint from my collages ( I never felt like I arrived at a good basis for conveying what I wanted to convey – I spent way too much time sitting in a chair staring at the paintings, and many of the decisions ended up being purely visual) I went home for the summer, and went out and painted on the coastal salt marshes. This was a revelation to me, I just connected with it instantly and it seemed like what I was feeling about my subject came through naturally. Following grad school, I lived in Houston for 3 years – that landscape was initially very tough to connect with, but it was also great because there was no hiding from the effects of humans. I had to really examine a lot of my beliefs and expectations about nature, about land use, about beauty, and so on. Many of us don’t grow up with painting and art as part of our daily life, and as a result, our routes into the fine arts are circuitous. How did you decide, “this is what I’m going to do”? I always wanted to be an artist; I drew all the time, although I didn’t have much contact with actual artists. My parents had an old friend who we saw every now and then who was an artist, but he lived such a strange life that I wasn’t sure I wanted to be that kind of artist. I was told that art was a great hobby but that one couldn’t make a living at it, and so I was kind of simultaneously encouraged and discouraged. But I don’t think I really understood what art was capable of until I had a memorable encounter with a Charles Burchfield painting at my college museum. It seems like so many artists have this seminal encounter with a particular work of art that ends up determining what kind of work they do ( something I would love to hear a discussion of, by the way) and mine was with his painting of some swampy woods in early spring. What transfixed me was his ability to manifest this profound inward experience, the kind of thing I hadn’t known you could transmit in a painting. It was incredibly intimate. I still love Burchfield. I don’t think my work looks like his, but that thing he was getting at; that’s what I want. What is a day in the studio like? The most interesting ones are when I’m outside, looking for a place or having found a place. I set up, paint in a kind of frenzy, for an hour or two, and come home exhausted. Back in the studio it’s more rational. More thinking and looking at the painting, imposing structure. I love painting outdoors, but nothing can be taken for granted – transporting the gear, dealing with the weather, insects, wind, finding a level enough place to set up, carrying the wet painting back. Also, I tend to like to be right up next to what I’m painting, so sometimes I’m perched on a slope or a big rock or crouching in a stream bed to paint – it’s so much easier in the studio. In landscape paintings, not so much, I usually have an idea what I’m going for. Collages or drawings from my imagination are completely improvised. The part of the painting that you hope no one notices is the part that will ruin the whole thing. There is a particular experience I have to have in a place if the painting is going to be any good. Sort of like a cross between a vision and a punch in the stomach. What is the hard part of painting? Finding the place – continuing to look when you keep coming up dry. And in the studio, knowing when to stop. When I’m outside, in a great place. The flow state – abandoning myself to the place. How important is accuracy in painting? What does the phrase ‘get it right’ mean for you? What I am after is to get a piece of the experience, the feeling, of being there, maybe a particular kind of the sublime which has nothing to do with spectacle, fear, or awe, but a more intimate kind – an Emersonian connection with my subject. But the feeling isn’t a transcendent oneness of everything, it’s more an awareness of all the little things, all the big and little creatures going about their lives, the slowness of the plants, the interactions, the conflicts, everything going on in those natural neighborhoods that has nothing to do with me. So many humans, at least industrialized, modern humans, have completely turned their backs on any sort of communication with the natural world, aside from maybe their pets. It’s like we view it as an object. That is something that never enters my mind. It’s not something that I think you can aim for. Extremely important. It’s definitely not the only thing, but it’s crucial. Without it, it’s hack-work, both in my work and work that I look at. Talk about your process a bit – is everything done on-site, or sketched and constructed in-studio, or started on-site and finished in studio? I rarely do the whole thing outside, except for the one-shots I do on paper. I used to always begin them outside and finish inside, and this would still be my preferred way of going at it, I think, except that the paintings got bigger and I just couldn’t haul them around any more. So now, I use the studies on paper as sketches – with more complex sites, like the Dead Hemlocks painting, I may have to do multiple studies and draw it as well. If the one shots go really well, sometimes I just stop there and don’t make a larger painting. Usually, though, I need to do some drawing after that, figuring out the format, placement, and so on. I do use photography as well – it’s important to know what the camera will and will not record. The more subjective aspects of my work, the sometimes wonky space, the color, the…whatever it is that comes out and grabs me, those things I have to get while I’m there, they will never come across in a photo. There are times/places where even drawing is impossible – and those I do entirely from photo, but they are rarely my favorite ones. I may take hundreds of shots of a particular place, exposing for different things, zooming in on certain spots, and then piecing them together in photoshop. It’s the only way to get my sense of space – a single photograph is always way too flat. Sometimes I will photograph the painting in progress and then draw on top of a printout. And with this project, I “drew” some of them by making digital composites of painted studies. 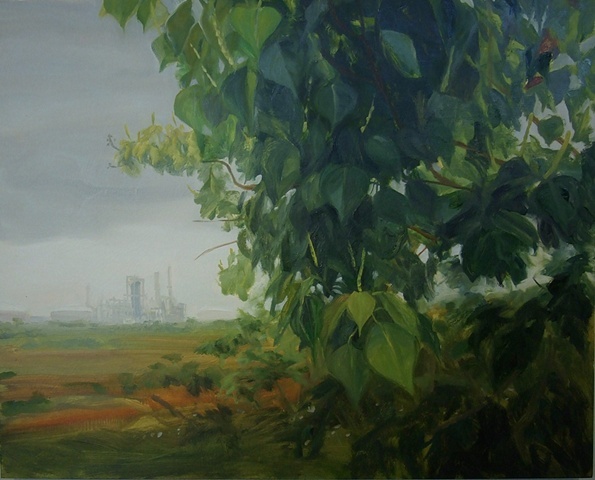 Some of the plants were actually hard to find, and sometimes I wanted to have other things in the painting, like the oil refinery in the Tallow Trees painting. This was definitely different for me, because usually the work is based completely on my experience at one particular site. 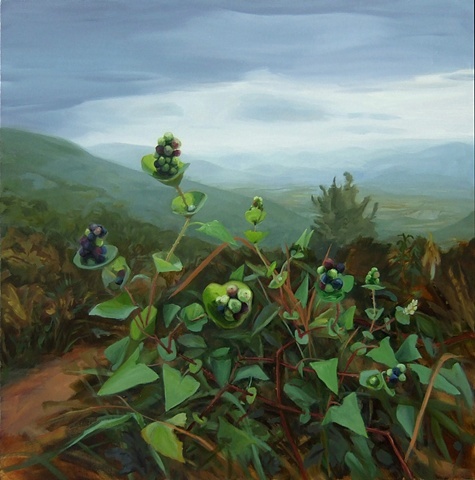 The newest paintings refer to specific varieties of plants: invasive species. How did you come upon this as a subject? A couple years ago, I read about the invasion of giant salvinia in Caddo Lake. I had always wanted to go there when I was living in Texas, but never did, and it had always been in the back of my mind as a place I wanted to go to. It’s a big wet cypress swamp/lake on the Texas/Louisiana border. It’s what you imagine the Okeefenokee swamp is like ( and isn’t – the Okeefenokee was logged a hundred years ago and has very few areas of old cypress swamp). Anyway, it was horrifying to me that this stuff could basically kill this place. That’s what got me started. I did go down to Caddo, and it was just amazing. It should be a national park or something. I had a kayak and spent several days paddling around. There are places where the trees are very dense, places that are open like ponds, places where the trees form these tall high-ceilinged spaces. I wasn’t able to paint in the kayak, though, which was really frustrating. It turned out that there are a lot of other invasive plants in Caddo, although none pose the threat that the salvinia does. For now, it’s mostly in the downstream part of the lake, but it is impossible to eradicate once it gets in there. In some places it’s so thick you can’t see the water surface any more. Once I delved into this topic, it just kept growing and becoming more fascinating to me – some of the alien animal species have the most gripping stories (Burmese python, asian carp, mitten crab) but early on I realized I would have to stick to things that would hold still while I painted them. The interaction between humans and nature would be the main thread that ties all of my work together. I’m not looking to make simple statements like nature= good, human=bad; it’s a deep and complicated subject. As I researched the topic of invasive species, my ideas about it kept shifting. The question about how to deal with invasives that are already here, and how much we should do to keep new ones out has a lot of passionate rhetoric on both sides. The salvinia in Caddo lake is an unmitigated disaster, to be sure, but plants and animals have been moved around by humans for thousands of years, for all kinds of reasons. Most of them don’t end up being a problem – no one wants to eliminate tomato plants, for instance, or even honeybees, which are not native either but are actually invasive. Or, for instance, Ailanthus trees – the dreaded “tree of heaven”, were actually native to North America before the Ice Age. Speaking about your practice in general: is there a type of place for which you go out looking? Do you tend to have an idea for a painting and then search for it, or go without preconceptions and look until you respond to something? Depending on the project, sometimes I am looking for particular kinds of sites. But usually, I am walking around waiting for something to hit me. In general, I am attracted to sites with water, and can’t go too long painting places without it. Dense forests are probably the hardest – there I am looking for some sense of “event.” Almost always I am looking for something that is interesting both close up and far away. I like to paint from my toes to the horizon. I looked at a lot of late 16th-early 17th century northern European landscape painting. Well, in fact, there isn’t a whole lot of it, but I looked at what I could. These are some of the earliest un-peopled landscapes in European art, painted when people were starting to look around at the natural world with scientific curiosity. There is this great combination of intense observation and a sense of the marvelous. And there is also this sense that they are trying to figure out how to make a painting that doesn’t have people. They are generally invented or composited landscapes, not the direct views that you get in later Dutch landscape painting. I still look at Burchfield a lot, and I also look at David Bates frequently to remind myself that it’s about painting what I think it is, not just what it looks like. Been looking at Josephine Halvorson lately. I read a lot of books about invasive species for this project. But right now I’m reading fiction. Couch. Maybe that’s where I get the notion that the landscape is full of narratives – I read a lot of fiction. Theory doesn’t do much for me – I am not an abstract thinker. I’m easily distracted, so when I’m painting I listen to a lot of minimalist music. Reich, Glass, other stuff that is slow. Hildegarde von Bingen. It irks me that there isn’t that much slow music with complexity and depth. But in general, music doesn’t have much to do with my work. We always ask artists about these three things–reading, listening, looking. Is there anything else we should be asking that would better address your creative activity? What are you eating? Do you ever see deer in your yard? Funny you should ask, I did see deer in my yard a couple of years ago (and I live just a couple blocks from North College, in the center of town [Fayetteville, AR]). Last year, when I had more time, I spent quite a bit of time learning bird songs by ear. When you pay attention, there is so much going on out there. The cardinals in my yard all have individual songs. Spending quality time outside is definitely a huge thing that affects what I do. I go wandering around in the woods looking for mushrooms, and it’s a very different kind of thing from hiking, for instance. The point isn’t to get anywhere, and it’s not about dramatic views, just an slow, intimate, up close kind of observation. It’s probably no accident that I’ve started painting things on forest floors. Really good read, Sam and Kristin. Thanks. 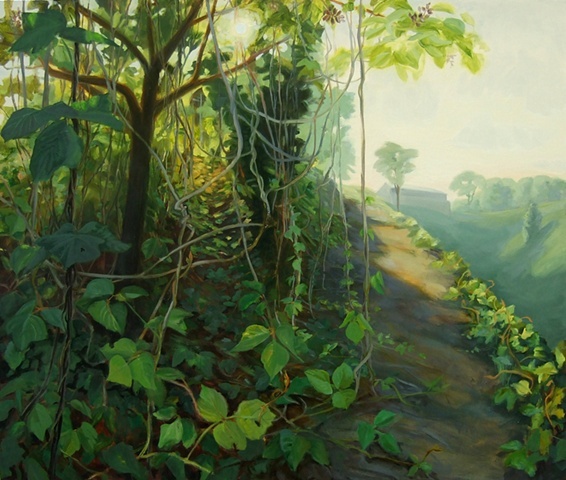 -I’m fascinated by the idea of landscape painting being about being up close, or artist’s-foot-to-horizon. I’d always thought of a sort of remove as built in. -The salvinia in the Caddo swamp makes me think of a ‘green’ Ice-9. -Kristin’s proposed topic, encounters with single works that stick with you is a good one. Sam, if you wanted to do a post asking people about their significant early encounters with artworks, I’ve got my answer ready. Wheels are in motion for that post. I enjoyed that interview. The work on paper is solid. I like the brush work.